Hi, I just installed Untangle Community and I've never used it. I would like to create a rule that allows a certain external IP to connect to 2 PCs behind Untangle. I would also like to use a masked port for each PC. I have looked online for some examples of how to set up Port forware, Nat, etc., but I did not find anything. I also did some tests, but nobody worked. Can anyone kindly write me how should I configure Untangle to allow me to do what I have explained? - Click add then advanced at the bottom of the pop-up. I would not recommend exposing RDP to the world, it's the great way to get crypto'd. 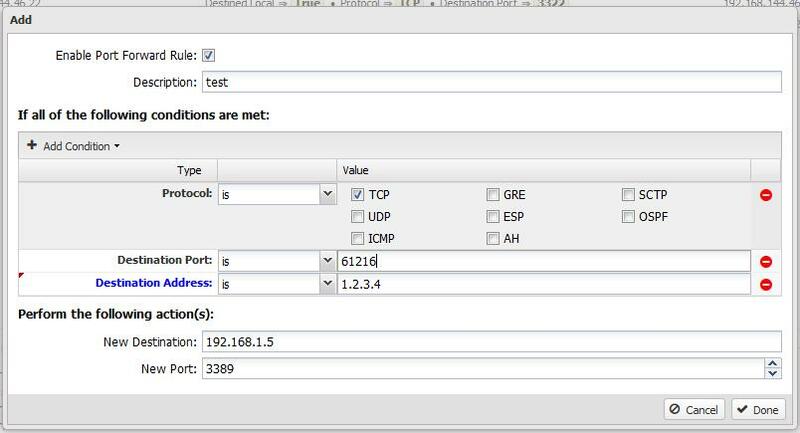 But if you have static addresses on both ends you can always add in a source address flag on the port forward and limit access to specified IP addresses. I agree with sky-knight... I recently picked up two new clients that had RDP Port Forwarding going on and not running on an Untangle NG Firewall... both got slammed with crypto crap. One was so bad it even encrypted the SQL .mdf and .ldf files in the protected "Program Files" folder. I would suggest OpenVPN and not use Port Forwarding.